I was on the west coast of Washington state in a small fishing town named West Port and stopped for lunch at a nice little restaurant named The Blue Buoy. Seeing that the coast is known for Fresh Seafood I needed to order something other than a burger and fries. You can get then anywhere. After reading through the menu a few times I decided on getting Oysters. To be exact an Oyster Po’Boy sandwich. What I ordered was a Po’Boy Oyster sandwich with a cup a clam chowder. It lunch was real good. The sandwich was “Dressed” very nicely as you will read and learn about below. 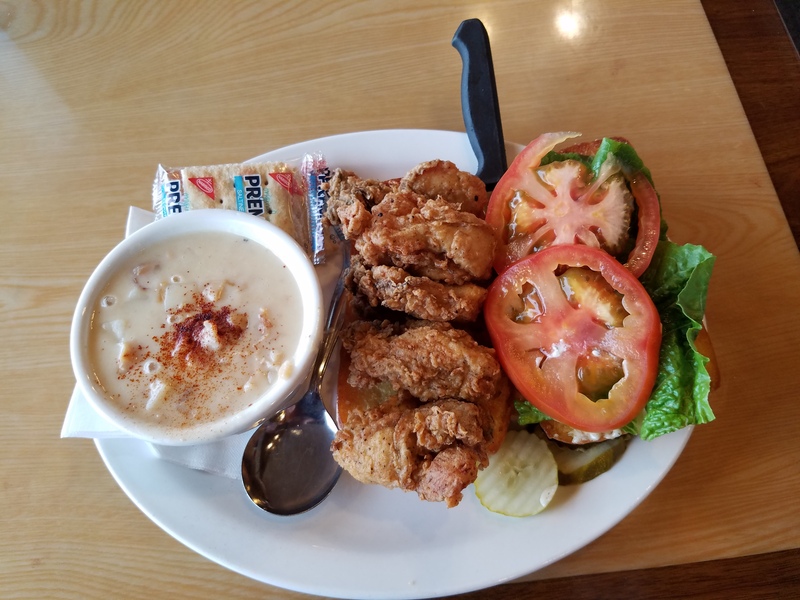 The chowder was very rich and the first bit was a lot different then the chowder that I was accustom to having, but it was packed with clams and by the second bit I was in to eating and enjoying it. The Oyster Po’Boy was fantastic! It ended up to be a little messy but well worth it. All the oysters were cooked perfectly and as you can see from the picture that the bread was covered entirely with oysters. In the late 1800s fried oyster sandwiches on French loaves were known in New Orleans and San Francisco as “oyster loaves”, a term still in use. A sandwich containing both fried shrimp and fried oysters is often called a “peacemaker” or “La Mediatrice”. The traditional versions are served either hot or cold and include fried shrimp and oysters. Soft shell crab, catfish, crawfish, Louisiana hot sausage, fried chicken breast, roast beef, and French fries are other common variations. The last two are served with gravy. A “dressed” po’ boy has romaine lettuce, tomato, pickles, and mayonnaise. Fried seafood po’ boys are often dressed by default with melted butter and sliced pickle rounds. A Louisiana style hot sauce is optional. Non-seafood po’ boys will also often have mustard; the customer is expected to specify “hot” or “regular”—the former being a coarse-grained Creole mustard and the latter being American yellow mustard. The New Orleans sloppy roast beef po’ boy is generally served hot with gravy and resembles a Chicago Italian beef sandwich in appearance and method of preparation, although the size, bread, and toppings differ. To make it, a cut of beef (usually chuck or shoulder) is typically simmered in beef stock with seasonings such as garlic, pepper, thyme, and bay for several hours. The beef can be processed into “debris” by cutting it to shreds when done (folklore says that a po’ boy roast is done when it “falls apart with a hard stare”) and simmering the shredded beef in the pot for a longer time to absorb more of the juice and seasoning. Today traditional po’ boy shops offer gumbos, bisques, jambalaya, crawfish kickers and boudin, a cajun sausage.